The science and tech sectors are the most actively supported industries within the business funding ecosystem; they are by far the most interesting to potential investors for a number of reasons, including the degree of disruption and innovation they offer. Despite this, the problem which the Business Funding Show keeps seeing, is that talented science and tech entrepreneurs still aren’t entirely aware of the finance options which are available to them. Hence, we are back with our popular ‘Funding for Science, Tech & Innovation’ event, taking place next Tuesday, at which you will be able to meet some of the top funders interested in science and tech businesses! Newable has a 35-year track record of unleashing the extraordinary potential of business people. They help businesses start up and expand through a range of funding and mentoring products and services. SyndicateRoom connects ambitious investors with the country’s most trailblazing companies. Started in 2013, SyndicateRoom has rapidly grown to have more than 100 high-growth businesses in its portfolio. Saatchinvest is a seed venture capital vehicle established by M&C Saatchi investing in early stage (seed to Series A/B) startup companies leveraging tech to solve everyday problems in a simple way. Street Global VC is a global investment fund is based in San Francisco, CA. The fund is investing in technology and tech-enabled, startups with the potential to reach $1B+ valuations. OION is a business angel network, which has an interest in companies with a strong barrier to entry, often patented, but with all having a strong vision for growth and seeking investment from £200K - £2M. techUK represents the companies and technologies ranging from leading FTSE 100 companies to new innovative start-ups. TechUK’s 950+ member companies collectively employ approximately 700,000 people – about half of all tech sector jobs in the UK. Alternative Business Funding provides a simple, safe, efficient, free and fair way for business owners to search for available finance without impacting their credit rating, with their unique Funder Finder engine. As a science or tech entrepreneur, whatever stage your business is at, and whether you are looking for capital or for support and advice, at our event you will be able to meet professionals who can help you with both. Our funders provide a wide range of services and tech and science networks, which your business could greatly benefit from. If you’re a startup looking for seed capital, be sure to speak to Saatchinvest, whereas if you’re a scaleup looking for your next stage of growth, it might be worth talking to Octopus Investments. If angel investment is your goal, SyndicateRoom and OION are great companies to approach. If however, you would like to find out how to join an extensive network of companies similar to yours, techUK is your best bet! We hope that all our science and tech entrepreneurs will have gained something from this event, and that our panel discussion will answer any burning questions which you might have regarding your available funding options! See you next week. 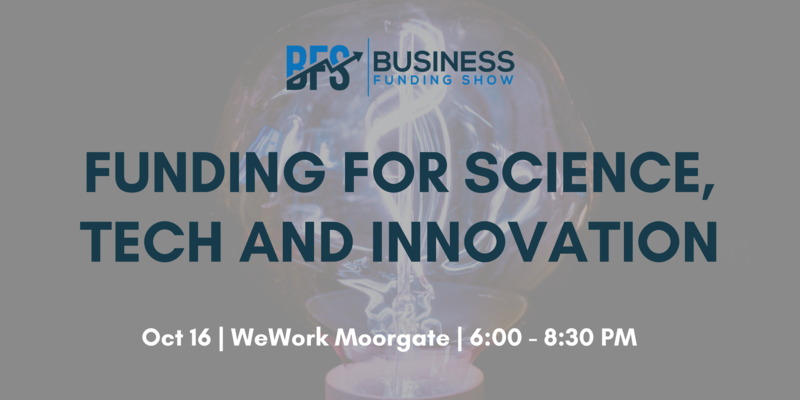 The ‘Funding for Science, Tech & Innovation’ event will take place at 6pm on Tuesday 16th of October 2018, at WeWork Moorgate. Click here for more info and to book your tickets. There are showcasing opportunities available for businesses that wish to maximise their brand exposure.